Currently on scholarship at Grand Central Atelier in New York, Hemali is comfortable not only existing in but relishing the exploratory stage. “There is joy in the pursuit of anything. The initial transitional excitement, hardships and arriving brings a sense of wonder to life. It is a journey.” This constantly recurring artistic arrival is also practical, because insights from each medium can be applied to its counterpart. 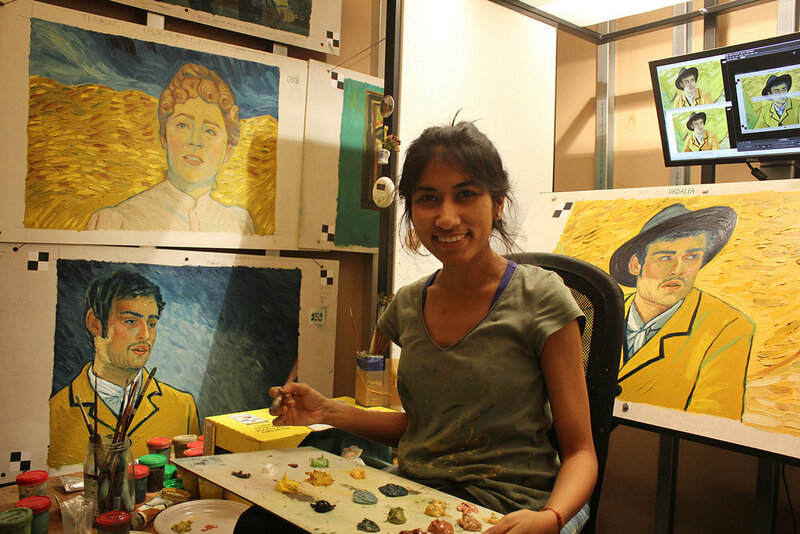 Below, Hemali also discusses the creative mission that bridges together each of her unique projects, her experience working on the Oscar-nominated film Loving Vincent, and her excitement for what's next in New York City. Tell us a bit about your creative background. Who is Hemali and how did she get here? I have always loved to make things. However, growing up in a well-educated traditional Indian family, I never thought I would take art up professionally. I studied Computer Engineering from Mumbai University and while working as a software programmer I used to make caricatures for my friends and family. At some point I realized that I would be much happier if I spent more time making art. I completed my Masters in Animation and Film design at IDC, IIT Bombay, which was my introduction to the creative field. I experimented a lot in animation techniques, ranging from paper cutouts to clay animation, sand art, and stop motion animation. I always like working with traditional mediums; it has a very different aesthetic and charm to it. When I was an animation student, I was introduced to the works of the old masters and classical art. In 2013 I saw the original works at museums in Paris. I felt compelled to learn what it would take to achieve such masterful and emotionally strong works. During 2013-14, I briefly studied at Angel Academy of Art and Russian Academy of Art in Florence Italy. Currently, I am on a scholarship at Grand Central Atelier, New York, studying classical realist art. I’m creating drawings from life and painting. And I love it! It is changing the way I approach everything else. What were some of the biggest challenges of shifting careers from software programming to animation, illustration, and art? Do you feel most at home within one particular medium? I have learned to accept the uncertainty that comes with shifting careers. One needs to be okay with not having a clear vision when taking the first step. If you are sincere and have patience, the vision will evolve over time. There is joy in the pursuit of anything. The initial transitional excitement, hardships and arriving brings a sense of wonder to life. It is a journey. Sometimes I need to slow down a bit in the process. Also, I know that becoming too comfortable wouldn’t help me grow. I keep discovering other masters’ works, which inspire me to become a better artist. After working on many paper craft and clay art projects, I feel very comfortable and confident when I have to illustrate or animate in these mediums. You have an incredibly diverse portfolio now, featuring hand-crafted paper design, pencil drawn portraits, and claymation shorts. Are there certain ideals, influences, or goals that bridge these projects together? Observe, study, and practice. This goes for everything, whether it is a drawing, painting or making illustration in paper craft or clay art or animation. It always helps to learn from nature and apply the knowledge in the work. I have been curious to try different mediums to convey messages in a way that is meaningful and fun to look at. Sometimes I make art to remember a special visit somewhere or the travel itself. When I look at it, it reminds me of the people I met and that life is good. I want to paint large figurative works in landscapes. There is still a lot I need to study in terms of storytelling, composition, and achieving technical skills. I think it takes patience and time. Currently, I am studying classical art and my intention is to take this knowledge and apply it to Indian aesthetic and create personal works. I love the audiovisual medium as much as I love to draw, paint, or sculpt. I was a painter and animator for Loving Vincent, a fully hand-painted animation film that was nominated for an Academy Award last year. I felt fortunate to have had this experience, combining my passion for painting and filmmaking. I enjoy working with people from big production houses to collaborating with other artists and individuals on a personal level. There are the two projects that introduced me to a very different culture and the way of life. 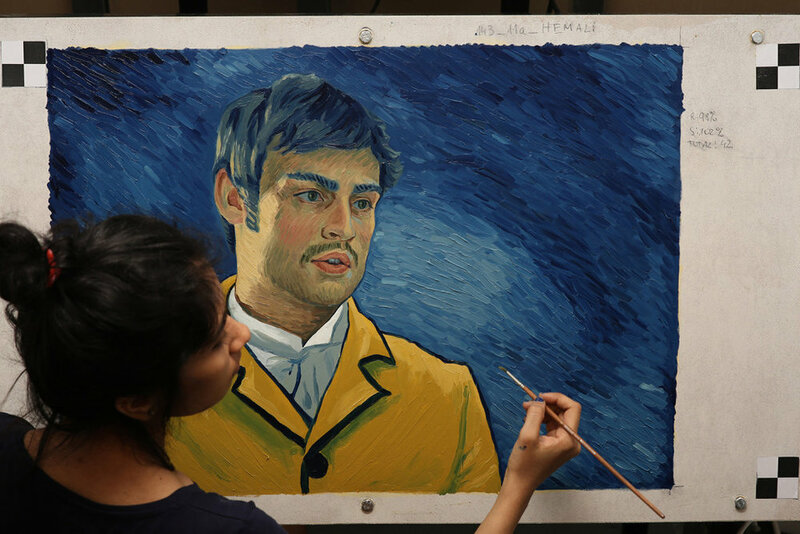 Working on the Academy Award-nominated feature film Loving Vincent: Over 5000 applicants all over the world applied and a group of 125 artists were selected to paint for the film. I am happy that this gave me a reason to go to Poland and I got to meet wonderful people and live in a different culture. It was a good experience working on this animated film. I painted 367 individual frames, which are all part of the film. My plasticine artworks were selected for an international art show ‘Plasticine Art’ at Old Jaffa Museum in Tel Aviv, Israel in April 2017. It gave me a reason to go travel there, opening up more artistic collaborations and developing bonds with the Israeli artists and musicians I met. You have traveled extensively for past projects and collaborations. Is that something that you’d look to do more of, or are you hoping to settle into a rhythm in New York and build your local network? It would be nice to travel and keep collaborating. I have changed and my work has evolved too because of the people I’ve been in contact with and the cultures I have experienced. I have become more appreciative of what I have and my cultural lineage. I am amazed by the diversity of New York City. You will always find a community or an environment conducive to the art you relate to. There is so much to learn and explore here. 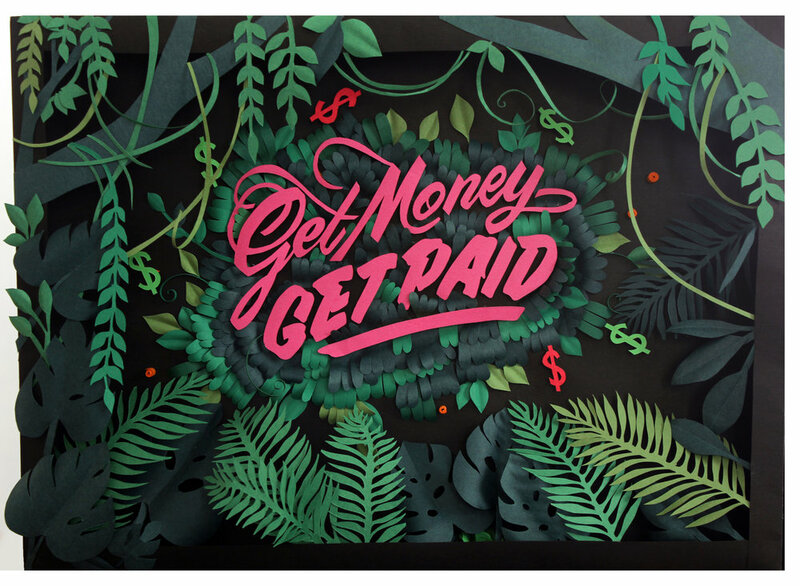 A paper craft design for Ladies Get Paid’s conference in New York City December 2018. How does the creative scene and culture of New York differ from other places you’ve traveled to thus far? The life is fast here in NYC. I think it teaches you how to get organized and be more focused. I had a very traditional upbringing with a chill and easygoing lifestyle and did not have a long-term goal when I started. Now I am learning how wonderful and rewarding it is when you create something that touches someone else’s life. The influences have changed over time; however, I have always been inspired by a strong sense of craftsmanship and involvement towards the work. I am really inspired and influenced by the works of Ilya Repin, Serov, Ivan Kramskoi, Sorolla, Andrew Wyeth, Sargent, Walter Langley, Camille Claudel, Rodin, Jules Bastien Lepage, Pascal Dagnan-Bouveret, and Gustav Klimt. I love animation shorts also; in a short time they sometimes give a very strong message. Animations by Caroline Leaf and Lotte Reiniger are delightful. Such incredible work has been done in the past that sometimes it feels daunting to reach that same level of mastery and perfection. I try to do the best with whatever skills I have gathered up to now. It helps to just show up everyday and do the work until clarity arrives. Also, I am a bit of an introvert so I find it challenging to reach out to people and talk about what I make. Slowly I am becoming more comfortable with sharing my work and using social media as a tool to reach out to a larger audience, often connecting with the people. Sometimes one makes friends or finds a mentor. These surprises add dimension and meaning to life. Creativity starts with training your eyes to see the beauty around you, and being sensitive toward your surroundings. Then expressing it or interpreting into the work you create. Also, it is so important to persevere and have patience. It helps to surround yourself with people who genuinely care and want to see you grow as a person and also in terms of the work you do. I like watching films, running, cooking, and then there are always books that you have started and never finished, so I read those. Currently, I am making figure studies and drawing all day. I am working on some personal compositions, and also producing paper craft illustrations. I intend to paint more and would like to go to Central Park with my paints and easel to capture the changing colors of the seasons.